Within hours, Union Minister of State for Home Kiren Rijiju said both the Centre and the BJP will ensure that elections are held on time. Representatives of 11 political parties in Nagaland, including the ruling Naga People’s Front (NPF), ally BJP and Opposition Congress, on Monday expressed solidarity with civil society groups and Naga tribal Hohos’ call for a solution to the Naga issue before the elections, and announced a unanimous decision not to contest the Assembly polls scheduled for February 27. Within hours, Union Minister of State for Home Kiren Rijiju said both the Centre and the BJP will ensure that elections are held on time. The BJP also suspended state leaders Tsasepi Sangtam and Kheto Sema, who had represented the party at the meeting and signed the “no-election” joint declaration by 11 parties, stating that they were not authorised to sign or speak without directives of the party’s central leadership. “…They are suspended immediately from the primary and active party membership; whatever they have signed is without the directives of the central leaders and so must be not considered as authentic and from the party,” the BJP said in a release. Rijiju and BJP national general secretary Ram Madhav on Monday discussed the issue of seat-sharing with Nagaland Chief Minister T R Zeliang and president of NPF Surhozhelie in Kohima. The all-party decision in Kohima followed an appeal by the Core Committee of Nagaland Tribal Hohos and Civil Organisations (CCNTHCO), which held two consultations on January 25 and 27 and appealed to all political parties to abstain from the elections before a final solution to the Naga issue is reached. It issued the call for “Solution before Election”. 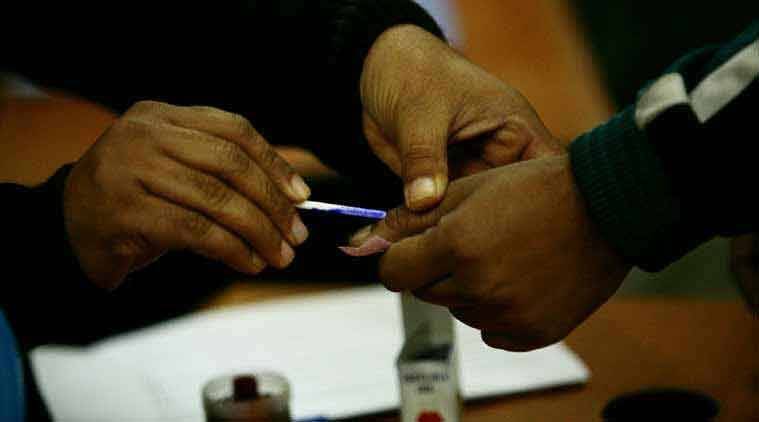 Nagaland Assembly had first demanded putting the election on hold. On December 14 last year, the Assembly had adopted a resolution asking the Centre to take “emergent and extraordinary steps” for an “honourable and acceptable solution” to the Naga political issue first. This is the second occasion in recent years that elections here are heading for a boycott. In 1998, NSCN (Isak-Muivah) and Naga Hoho had called for a boycott — the Congress had swept the polls by winning 53 of 60 seats, as other parties heeded the call. “We firmly believe that it is expedient for all political parties, both national and regional, to come together in the greater interest of the state… and defer the elections… and allow the Naga political process to reach its logical conclusion by giving space and time to the negotiating groups to bring out an early solution,” the joint declaration said. Among those who signed the declaration are I Imkong, former state Congress president; Kheto Sema, state executive member, BJP; Apong Pongener, working president, NPF; Alemtemshi Jamir, working president, Nationalist Democratic Progressive Party; and S Longkumer of Aam Aadmi Party.